The Fusion Middleware 12.1.3 platform contains the ESS or Enterprise Scheduler Service. 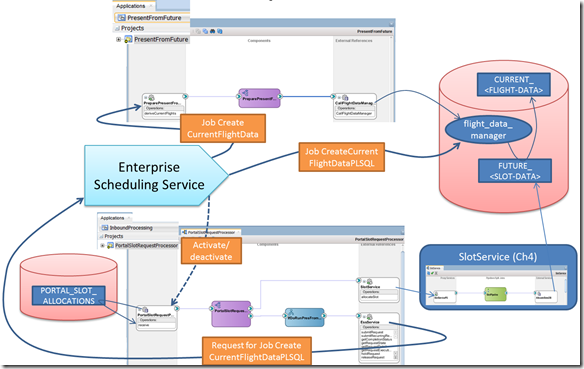 This service can be used as an asynchronous, schedule based job orchestrator. It can execute jobs that are Operating System actions, Java calls (local Java or EJB), PL/SQL calls, and Web Service calls (synchronous, asynchronous and one-way) including calls to SOA composite, Service Bus and ADF BC web services. Schedules used for planning the execution of a job can define a single, future point in time or may describe a periodically repeating pattern for the execution of the job. Jobs and schedules can be defined from client applications that access a Java API, through the Enterprise Manager FMW Control user interface for ESS and through a Web Service. 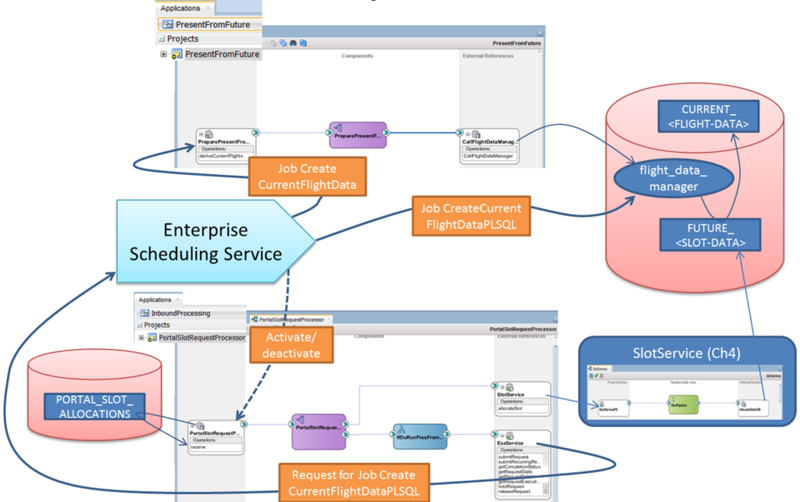 This Web Service through which (predefined) jobs can be scheduled can be invoked from BPEL processes in SOA composites, using a special Schedule Job activity. Additionally, a Service Bus business service for invoking the ESS Web Service can be created and a Mediator or Spring component can make that call from a SOA composite. The ESS is used by administrators for the activation and deactivation of [inbound] adapters based on a schedule. Key reasons for scheduling the availability of adapters are the availability of back end systems – why start processing messages on a queue at any moment when we know that the ERP system that needs to be invoked is down every night – and the load on the system – let’s handle the low priority inbound flow of documents at a time when the system is not swamped with a peak load of more important processes. In this chapter we will create a schedule for activating and deactivating an inbound (database) adapter, create and execute an ESS job schedule that executes a composite [service] and create a job from within a BPEL process. Sources for this chapter can be found on Github: Chapter 14 sources.